Jean Benoit-Levy (left), Director of the U.N. 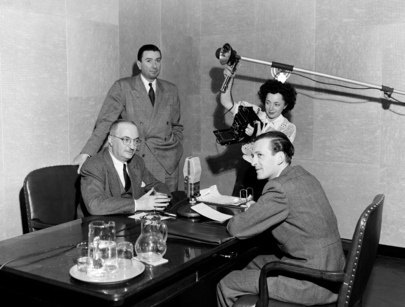 Films and Visual Information Division, is interviewed by Pierre Crenesse (sitting opposite), Director of Radio Diffusion Française for North America, during broadcast to France. Standing is Paul Bouchon, Chief of French Section of UN Radio Division, and Maria Bordy, U.N. Official Photographer.